Posted on November 30, 2012 by Michele D.
Boring Ole Sesame Seed and Poppy Seed Challah degisned by the Ema! Posted on November 28, 2012 by Michele D.
I love hamburgers, but I’ve never had much luck making them. I can never get the seasoning quite right so they end up tasting bland, which is why I was thrilled to find Susie Fishbein’s Moroccan hamburgers recipe in the Kosher by Design Short on Time book (page 148). The seasoning mixture is fun and spicy and always surprises my guests because they never expect the meat to have a slight kick. 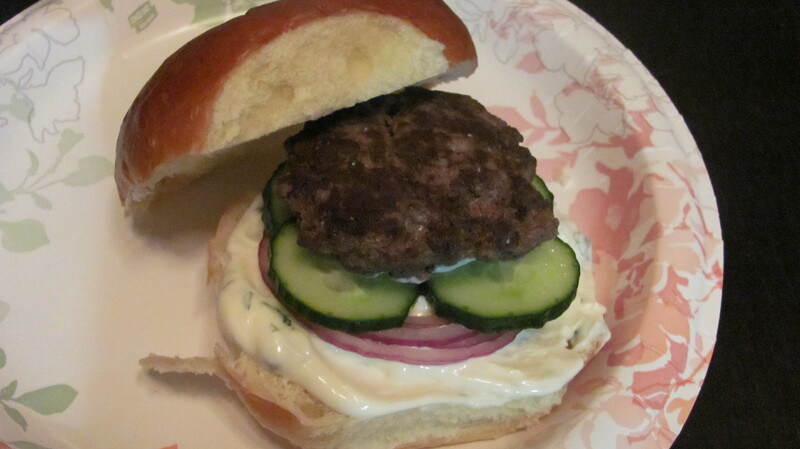 But the best part of this burger for me is the mint mayonnaise spread that I liberally lather on the bottom bun. It gives the impression that I’m eating … yes I’m going to say it … a CHEESEBURGER! If I close my eyes while I’m eating the burger, I can almost imagine that I’m biting into a juicy burger covered with a thick slab of melty Swiss cheese. It’s that creamy, yummy delicious. Another fun fact about this recipe is the sliced cucumbers and red onions soaked in apple cider vinegar. I once had a family over for Sukkot and served these burgers. Their 1 year old daughter could not get enough of the cucumber slices. It made me think that next time, I might just make a big bowl of those cucumbers for folks to munch on for fun. If you haven’t made these burgers before, it’s definitely worth a try. They are simple to prepare and you might even add a bit of guacamole to spice things up even more. I haven’t tried that version but it seems like it might be a good addition. Mix the ground beef in a bowl with the oregano, ground coriander, salt, black pepper, paprika, cayenne pepper and red pepper flakes. Mix well. Form into 6 patties. Heat a grill pan or medium skillet over medium-high heat. Add the oil and heat until almost smoking. Add the patties and cook 5 minutes per side. Try not to move the burgers around so you will get nice grill marks and a good sear. Re-oil the pan as necessary if working in batches. Place the thinly sliced cucumber and red onions into a medium bowl. Toss with the vinegar and allow to stand for a few minutes. In a small bowl, mix the chopped mint into the mayonnaise. Set aside. When you remove the burgers from the pan, place the buns, cut-side down, into the pan. This will toast them and at the same time they will pick up nice flavor. Spread both sides of the toasted buns with the minted mayonnaise. Top each Moroccan burger with a few slices of the cucumber and red onion. Posted on November 25, 2012 by Michele D.
We decided to skip the formal Thanksgiving celebration this year and head to SeaWorld San Antonio instead. The Wednesday-night drive to SA was a bit hectic thanks to loads of holiday traffic but we made it safely and enjoyed some amazing weather at the park on Thursday. We even managed to close the park down Thursday evening at 9pm and had seen/done everything we wanted to do except for the Penguin encounter … we’ll have to do that one first during our next visit. 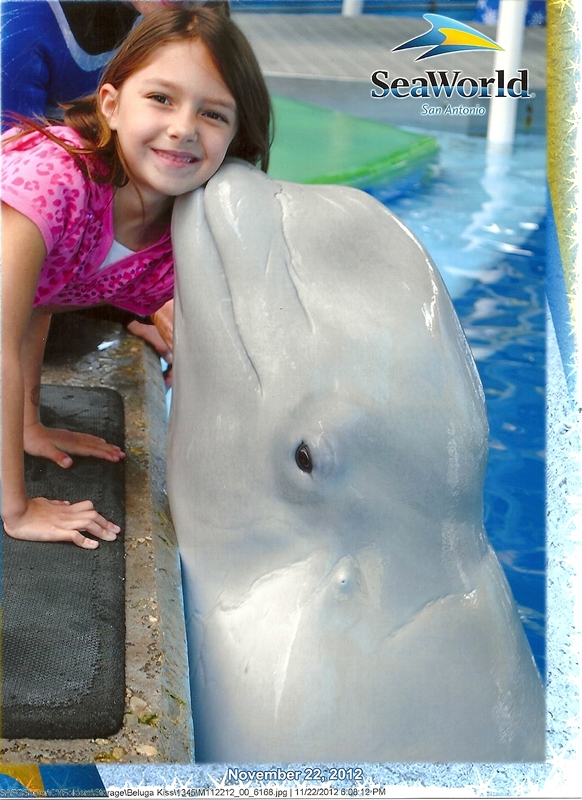 The highlights of the day included our Beluga Whale up-close tour where we got to hang-out with and be kissed by these very cool animals and my personal favorite was feeding the dolphins at Dolphin Cove. We realized at 5:45 that Dolphin Cove was closing at 6pm and we were on the oppostie side of the park. I’m so very thankful to my hubbie and daughter for running across the park with me to reach the cove in time to feed the dolphins. And I’m thankful to the SeaWorld employees at Dolphin Cove for staying open a bit later to accommodate us. Finally, I’m thankful to my in-laws for saving their leftovers from Thanksgiving so we could have a lovely Shabbos meal when we arrived home … right before Shabbos started … on Friday evening. All I had to cook was matzah ball soup and we were set for a yummy meal … it was sort of like our delayed Thanksgiving. 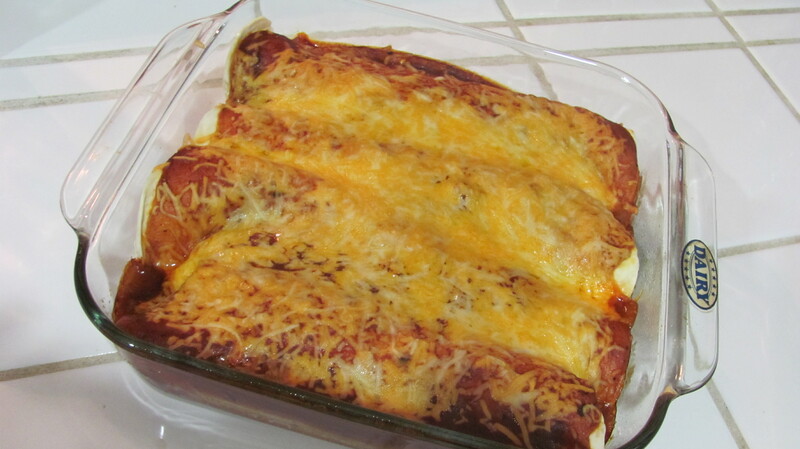 Posted on November 9, 2012 by Michele D.
Bake the enchiladas for about 25 – 30 minutes or until the sauce is bubbly. Serve immediately if possible while the enchiladas are hot. 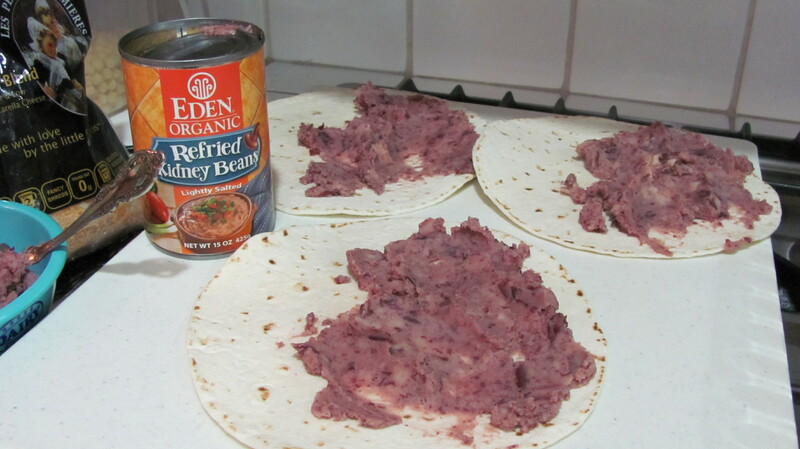 That’s it … a quick, easy breeze kosher dinner. Try it and let me know what you think. Animal Wednesday – Pumpkin Recipes Anyone? Posted on November 7, 2012 by Michele D.
One of the most wonderful things about blogging is that you get to virtually meet lots of great people. Years ago, I stumbled across a blog called Auntie Mims that talks about art and life, and on Wednesdays, the author discusses animals … hence the title of my post … Animal Wednesday. I never thought I’d have an opportunity to mix the topic of my blog – food – with Mim’s Animal Wednesday theme until this past Sunday when I visited the Dallas Zoo with my family. 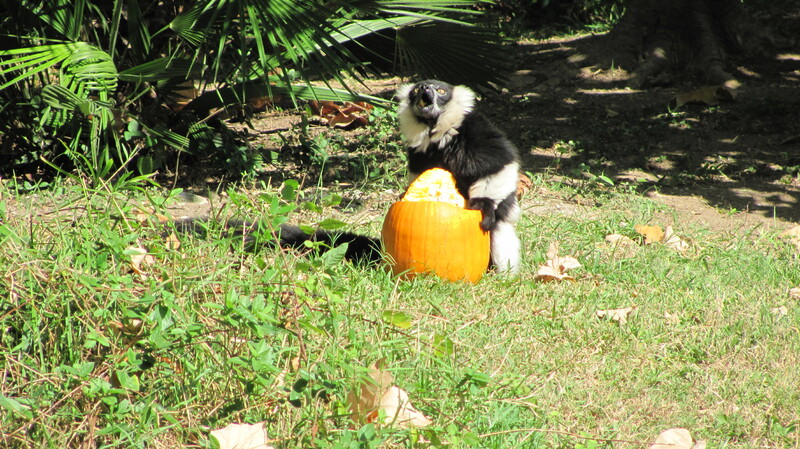 Since our trip was on the heels of Halloween, there were pumpkins everywhere, including inside the animal’s habitats. 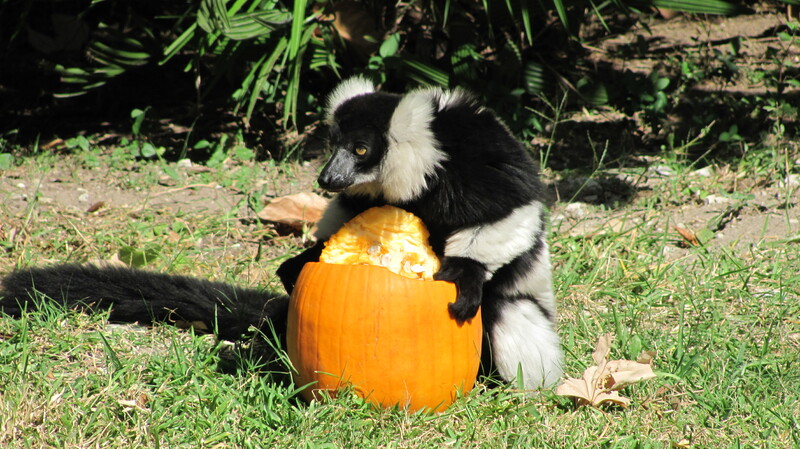 As we were leaving the zoo, we saw this adorable Lemur happily munching on a pumpkin and enjoying the beautiful 75 degree Texas winter weather. This little guy (or gal) is loving the pumpkin all natural style but it did make me think about ways I could cook with pumpkin. And with Thanksgiving just around the corner, maybe it’s time to get creative with this orange vegetable … or is it a fruit? I have made pumpkin muffins in the past that were delicious and a big hit with the kids. Plus, there’s always the standard pumpkin pie. But what are some other ways you can cook wth pumpkin? I’d love to hear your favorite pumpkin recipes. Happy Animal Wednesday and Happy Kosher Treif Cooking!